iJim: What Does The "i" In iJim Mean? What Does The "i" In iJim Mean? Have you ever wanted to know what the i in iJim stands for? is iJim an Apple Fanboy or is it something else? When I first started writing a blog, all those years ago I chose the name Noscere, the latin word for "To know, learn", I called my blog Nosceres World but the problem was, when people asked what my blog was called, I ended up having to spell out the word Noscere, or I would write it down for them. Pro tip: When choosing a name for your blog, choose a name that people will remember, something that will stick in their mind, I didnt and I must have lost a lot of possible visitors. Anyway, a couple of years later I killed off Noscere and and created the name iJim, about the same time as I started my first YouTube channel. OK, history lesson over. Why iJim, and what does the i stand for? I think I should start by saying that I chose the name iJim before I knew about the internet celebrity and Youtuber Justine Ezarik aka iJustine. I am not a fan of Apple products and to be honest, I dont own a single iProduct although I would be more than happy to be able to write my blog posts on a Mac, I dont. My phone is a Samsung, my laptop is a HP and my desktop computer is a broken down eMachine (yes, its that old). So What does the i stand for then? Well, everyone has a favourite type of movie, a go to film type that just gives them that feel good factor and lets them escape reality for a couple of hours. Disney, Anime, Super hero movies, the list is endless. For me it has to be horror movies. 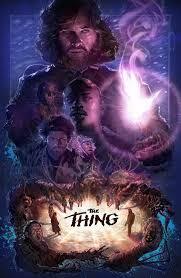 When I was about 15 years old, I watched a movie called The Thing based on the novel by John Carpenter. There was one part of the film which scared the life out of me and kept me awake at night for days after. Since then I have been on a quest of sorts to find another movie that will do the same to me (so far I have failed). I am not a big fan of gore movies where there is just gore and violence for the sake of it. I like a good story line with character progression. I prefer the traditional movie type, you know, Alien invasion, Vampire, werewolf, that kind of thing, my favourite horror genre has to be the Zombie genre, I dont know what it is about "real, serious" zombie movies but I will quite happily settle down and watch anything if it has a chance of including zombies, which is where the i in my name comes from. The i in iJim stands for infected, so my full title would be Infected Jim. Question time: Do you have a favourite, go to movie genre? If you do, what is it and, what is it about this kind of movie that keeps you coming back?